Homeroom Lofts offers residents the unique charm of a meticulously restored historical landmark with the convenience of modern appointments. Nine-foot ceilings, oversize windows and sliding glass walls create light and open living spaces accented by charming period style lighting and trim. Modern luxuries and conveniences have been incorporated, including sophisticated glass and ceramic tile bathrooms, solar shade window treatments and modern kitchens with a breakfast bar, stainless steel appliances, and natural stone countertops. 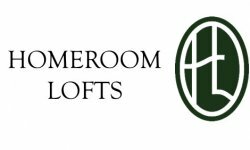 Nestled in a picturesque estate, Homeroom Lofts offers over 1.75 acres of outdoor green space. A community courtyard allows residents to enjoy the tranquil locale and fresh air.